Kids can be picky. I know… I’m a mother of a two year old, was a nanny while in college, and I probably grew up with the pickiest brother of all time (If a food he didn’t like touched a food he did like, it was over– really over). Now, I can’t guarantee you are going to breed a foodie, but these simple changes can really make meal time less of a struggle! 1. Give them the Food Fun Facts! Kids love learning. Their brains are little sponges. Next time you’re making a snack (start small) tell them all you know about it. Not just how to make it, but where the ingredients come from, why it’s called an eggplant yet their are no eggs, etc. Why do you think your kid knows so much about dinosaurs, trains, and kittens?— Fun Facts! This is something that’s said over and over again when people talk about getting children to eat better, BECA– USE IT WORKS! It doesn’t have to mean that you need to get them in cooking classes. I’m fond as the try as you go. Take onions for example. Try them raw, try them soft, then try them browned. When you eat do you constantly make substitutions to your food? Well– STOP! Now, unless you have some allergy or dietary restriction you aren’t setting a good example for your kids. If they look at dad and see that he is picking off all of the radishes on his plate then what makes you think the kids won’t be? Picky parents produce picky kids. So often we are caught up in everything that is going on around us that we don’t get a chance to sit and eat with our family. When we are in a rush we make poor food decisions. Slowing down to enjoy your food, and the company around you sets a good, safe environment for you and your kids. When kids feel happy and secure they are more likely to try new things. Kids dare other kids to eat and do the grossest things. I remember someone daring a kid to eat a worm once– or maybe that was an adult, and that worm was at the bottom of a tequila bottle. Either way, be brave and try things with them. I know so many kids who love calamari just because they like telling people that they are eating squid. I remember very vividly coming home from school one day absolutely CRAVING cottage cheese. Previous to this day I may have tried it a couple of times, but the thought of curdled milk really threw me. From that day on I loved it. Kids change their ideas, and thoughts of lots of things. Just because they didn’t like something last month doesn’t mean they won’t like it this month. So many times I hear all about how someone doesn’t like something. The way you need to start phrasing this is “I haven’t had… prepared in a way I have liked yet”. You may not like the way that someone has prepared a dish, but maybe if it was prepared differently you may love it. You never know. EEEK! This one is probably the hardest one for parents to do. While younger kids can benefit from learning and saying what everything is, older kids can actually pick out their meals. Give them a task, let them pick the ingredients and come up with a meal! Make it quick, stay away from the middle aisles, and don’t expect to do this during a big shopping trip. I know the thought of a HUGE mess in your kitchen can really deter this from happening, but it’s great! 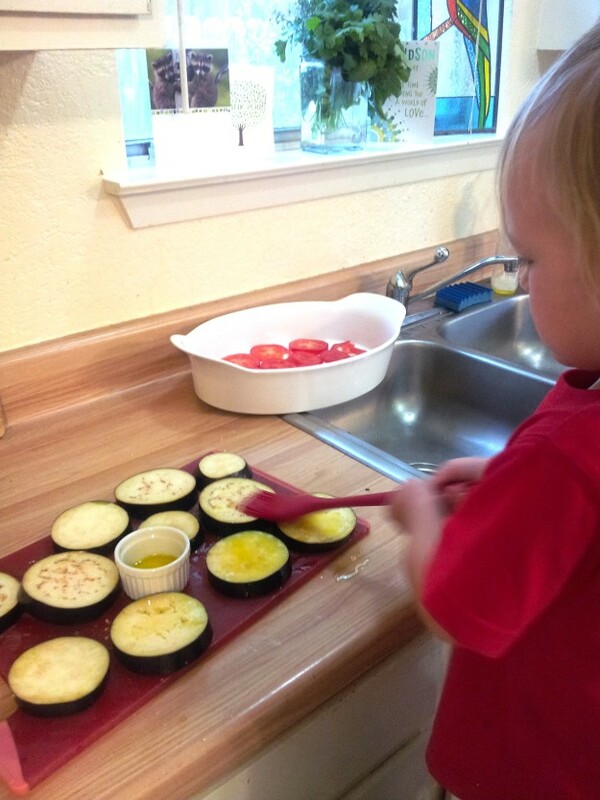 My son is two, he’s not really “cooking” but he gets really involved. He pulls up a chair to my work area and loves getting his hands dirty. Whether you are playing in dough with younger kids, or julienning vegetables with your teenager, you are doing something as a family. Your kids will remember the moment, you will remember the moment, and chances are they want to taste their creation.